While we were in Norway, we had the pleasure of playing hosts to Nick's little sister Tess and her boyfriend Jasper. They live in the Netherlands, so thanks to cheap airfare inside Europe, they were able to make the short hop up to Norway to spend a few days with us. It was great because Tess hadn't seen Espen since he was two days old, and we just plain old like her! I think it was especially fun for Nick to get to show his little sister around the country he lived in for two years. One day we took Tess and Jasper down to Oslo. Thanks to my parents, we had some more than willing babysitters who took care of Espen so we could spend the entire day in he city without worrying about wearing him out. Instead, he wore out his granny and granddad! Our first stop was the Viking ship museum. It houses three full-size viking ships, the oldest of which has been dated to about 815 AD. I had visited several times over the years, but the beauty and history of those ships just gets me every time. It is significant to feel that connection to the people who once lived and worked in my country. Norway has such a rich heritage, and I am so proud to call it my own. 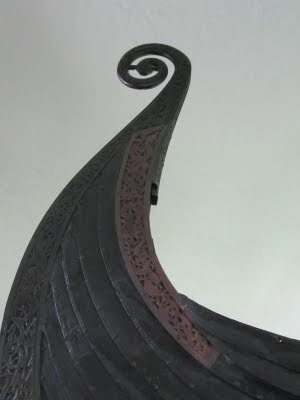 A detail of the Oseberg ship, built fit for a queen. One of the best things about Oslo is that it is built on the Oslofjord. This means that at least half the city has an ocean view, and it means that there are ferries that connect the areas along the fjord to the city. Travel tip: Buy a pass to the city's public transportation (bus, subway, tram) and it will include use of the ferries. We took the bus out to the museum, and then the ferry back again. Unless you're planning to leave the city, don't even think about renting a car. Parking is outrageously expensive, and you will waste lots of time sitting in traffic. Public transportation is the way to go. Tess and Jasper waiting for the ferry to take us back to the city. 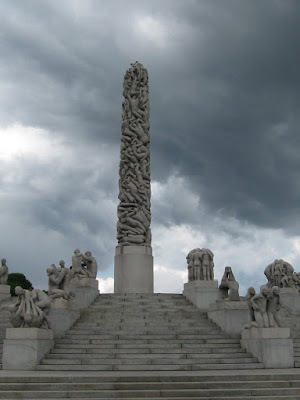 After lunch, we hopped on the tram up to the Vigeland park, another must-see in Oslo. It is a large park that displays more than 200 sculptures by the artist Gustav Vigeland. We heard a huge clap of thunder as soon as we stepped into the park, which cleared out the tour buses in minutes. We sheltered under some enormous oak trees which kept us dry and (mostly) warm until the storm passed, which really wasn't long at all. While we were standing there, it was fun to notice how easy it was to spot the Norwegians in the crowd, as they were the ones who seemed completely un-phased by the weather. Climbing the steps to the Monolith. One of my very favorite sculptures. After the park, we caught the tram downtown again, and walked down Karl Johan, which is the main street in Oslo. The palace sits on the hill at one end, and unromantically, the train station at the other. Along the way we passed the university of Oslo, the parliament buildings, the Grand Hotel where the Nobel Peace Prize is presented every year. And some shopping. Nick and I stopped off for books, and Tess and Jasper detoured for some gelato. After that we hobbled across the street and loaded our tired bodies onto the bus home. We really enjoyed playing tour guide to Tess and Jasper, and it was good to know that even though it has been years since I lived there myself, I can still find my way around the city. I was never much of a city girl, but Oslo still feels a bit like home. WOW! I know very little about Norway, and it has been fun to see your pictures and read some of your happenings! I'm completely taken back by the Monolith! That's amazing!